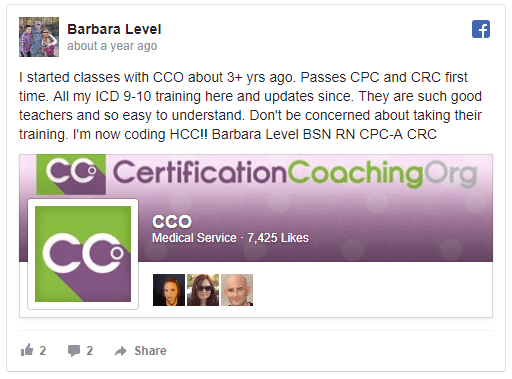 For over 16 years we have been teaching this medical coding course – with many students successfully passing their first CPC® exam after training with us by viewing our videos and learning our techniques. This Physician Based Medical Coding course will provide you the training you need to learn HOW to do medical coding and gives you all the training needed to pass the AAPC CPC® certification exam or other physician-based coding credentials like the QMC (from QPro), CCS-P (from AHIMA) or CMCS (from PAHCS). You will be ready to start your new Medical Coding career. Our goal is to give you all the current information needed to be a successful medical coder AND pass your medical coding CPC exam test. This includes training in CPT, HCPCS and ICD-10-CM as well as understanding payment methodologies. When you are finished with our medical coding course online, you will be able to review and assign the correct procedures and diagnostic codes for patient encounters in a physician office or outpatient setting. Not sure if that local school down the street has good medical coding certification program? Curious if you actually need to attend a local college because you prefer a medical coding course online? Worried about reports of people attending a $19,000 online medical course and not having the skills to even pass the national certification exam? Wondering if you will finish your medical coding certification program in the typical 4 months online programs give you to finish? Wishing someone would just take your hand and guide you to become a medical coder from beginning to end without emptying your wallet? If You Need a Medical Coding Course, You’ve Come to the Right Place! 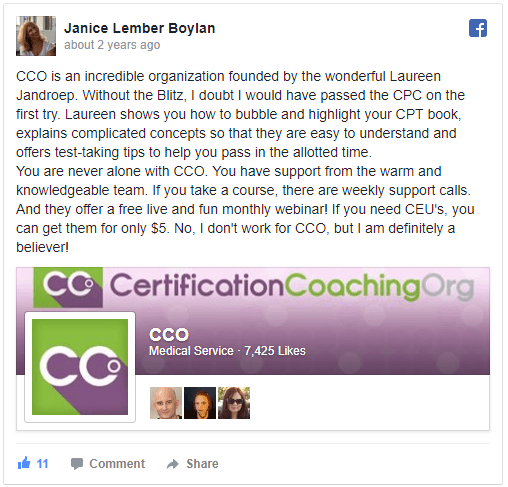 My name is Laureen Jandroep and I'm the founder and CEO of CCO. I hold the following credentials – CPC, CPC-I, COC, CPPM, CMSCS, CHCI, CDEO. 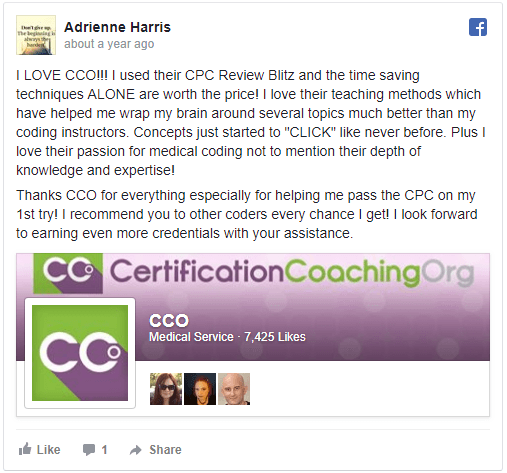 I’ve been teaching and coaching medical coders to prepare for certification by the AAPC (formerly American Academy of Professional Coders) or the American Health Information Management Association (AHIMA) since 1999. Other certification exams I have taken and passed many include the CCS (Certified Coding Specialist by AHIMA), and the RCC (Radiology Certified Coder by RBMA). I basically thought I was going to be an Occupational Therapist when I grew up and I was for a number of years. I actually ran a therapy practice here in South Jersey. At our zenith, we had about 27 therapists, aides and office staff. On average we did over 1.6 million in billing a year of which I was quite proud. But what I was most proud of is that we had less than a 0.06% rejection rate and that was because we did good coding. Kind of by accident, I basically had to do billing. I had to learn about cost reports and all of that. I got out manuals and I actually read the introductions of my coding manuals. We had a very low denial rate and in the rehab industry, that’s just unheard of. So I have taken an interest in coding since back then. Medicare basically changed the way rehab agencies like mine were able to bill, and many of us went out of business. So I got into the billing and coding world. I ran a school for a number of years which I loved… and guess what… I’m still teaching even now! Certified Coding Specialist-Physician Based (CCS-P) exam by the American Health Information Association (AHIMA). Regular coaching sessions and review of your progress. Healthcare workers looking to switch roles at their workplace such as front office clerks, medical receptionists, case managers, medical records clerks, transcriptionists, schedulers, research coordinators, nurses, caregivers or similar roles. This isn't a short one-time bootcamp or webinar event. 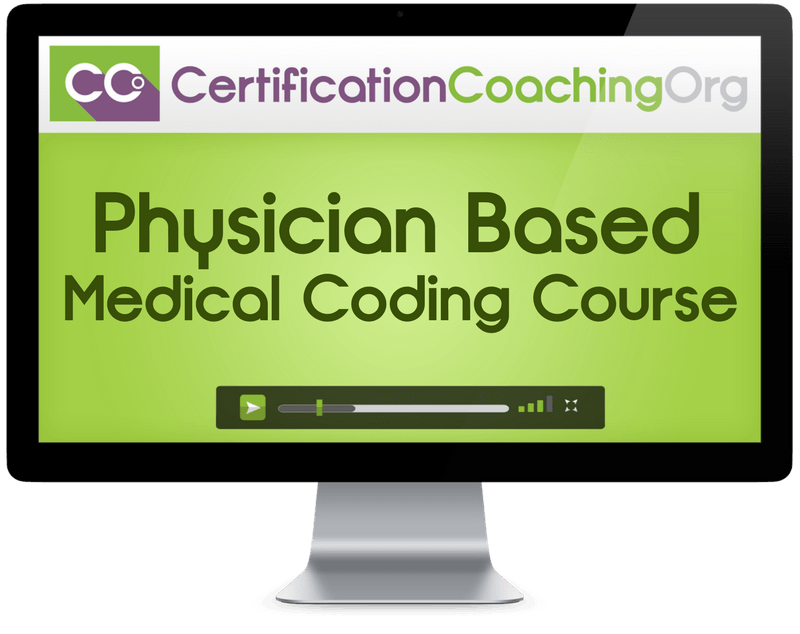 This is a full and comprehensive course which dives into the details of medical coding at a physician or medical office. We include 9 months of continuous access to the medical coding course online. If you decide to take a break, you can always return anytime during those 9 months to pick up where you left off. Our instructors frequently meet with students in a live video conference to answer all course and career questions. As a full course student you're invited to call in and ask questions during the live event. We normally charge $229 for access to the CPC Review Blitz for exam preparation. When you purchase this course, you'll receive access for free while you're a student of this course. Need to refine, refresh and review ICD-10-CM skills? This $197 ICD-10-CM Review Blitz is included free with the course so you can make sure you've truly mastered ICD-10-CM coding. We normally charge $69.95 for access to the 180 Question CCO Mini-Mock Practice Exam Bundle. With this course, you'll receive access for free while you're a student of this course. We're including access to our $67 Modifiers Class so you can learn the topic in additional detail. The BHAT® Cave is a private members area that shows you exactly how to mark up your CPT and ICD-10-CM Manuals using the BHAT® method. This bonus is priceless in our opinion. 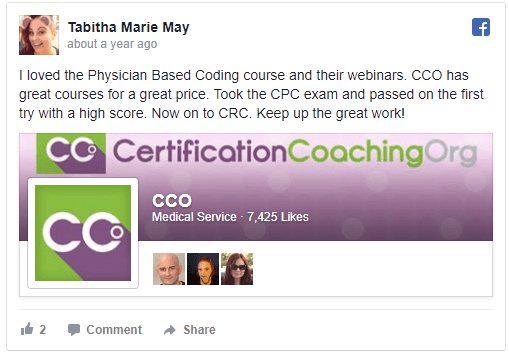 How Does Our Online Medical Coding Course Compare? Invest In Your Medical Coding Career Today! Already Took a Full Medical Coding Course Elsewhere? Is there a textbook included for the Medical Coding Course? No. Students will need to supply their own manuals for this medical coding course. You're welcome to purchase from our bookstore or another supplier. Click here to see the books required for this course. No, there are no CEUs included with this course effective Jan 17th, 2019. If you need CEU's, please consider joining the CCO Club. Are all the videos instantly available for viewing? Yes! You can watch them immediately after placing your order. No. This is a full, comprehensive course similar to the ones offered at local colleges and was purposely created to help you become certified and pass the exam. Our members area offers online streaming videos that are fully compatible with the newest web browsers from Internet Explorer, Microsoft Edge, Firefox, Chrome and Safari. Older versions of web browsers will not work since they do not support HTML5 or modern video files. We recommend a modern Computer, Laptop or Tablet and a high-speed internet connection to experience smooth streaming playback of our HD videos. Slower computers (pre-2010) and internet connections will result in choppy playback and browser errors of the videos. Android devices are not officially supported, but students report the medical coding course videos play well on them.